Michael's vibrant art work will make a very special addition to your synagogue, office or home. Individualized commissions are a perfect way to have a work of art created to be just the right subject, size, style, feeling and atmosphere for a particular space. Michael works collaboratively with you to ensure that all of your needs are fully satisfied. 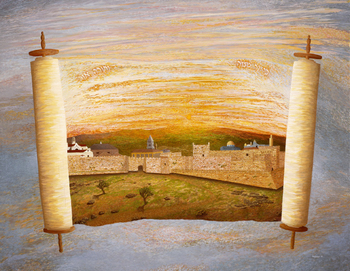 For example, Jerusalem Sunrise (shown below) was created to hang on the eastern wall of a sanctuary at Temple Ner Tamid in Montclair/Bloomfield, New Jersey. This contemporary "Mizrach" not only represents the east, but the synagogue's name - "Ner Tamid" - was also worked in as an element of the painting. As Artist-in-Residence, Michael will help create a unique Shabbat experience for your community, filled with art, music, discussion, study and creative workshops. Michael is not only an accomplished artist, but is also an inspirational teacher and musician. He is available to spend a day, Shabbat or weekend, providing music, art, talks and workshops. He has an energetic, captivating and participatory approach to speaking, and can address issues of contemporary Judaic art, the creative process, interpretation and use of biblical texts in the arts, the relationship between Judaism and art, his own art work and that of others. He is an experienced teacher, and can lead hands-on workshops. He is also a talented pianist and guitar player, and can serve as an accompanist for Shabbat and Havdallah services. Contact Michael at MichaelBogdanow@gmail.com for further information.